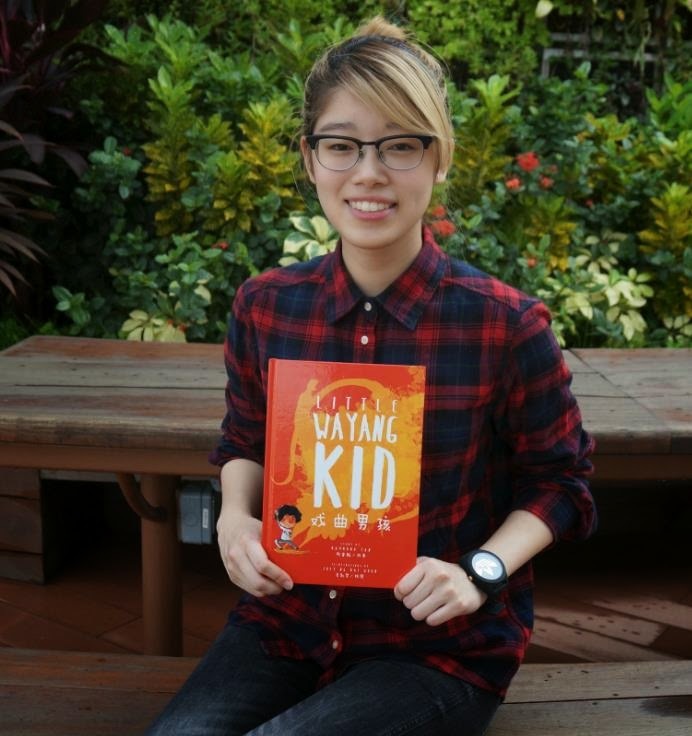 Hong Kar Yiu, Nanyang Polytechnic (NYP) alumna, made a mark on the world with her creativity. These days, she dreams of benefitting others with her future inventions. Indulging in our favourite food is something we take for granted. But Kar Yiu, who was diagnosed with Type 1 diabetes when she was nine, was determined to savour the sweet taste of ice-cream again. “I joined NYP’s Diploma in Food Science & Nutrition because I hoped to learn about and develop suitable food that diabetics can enjoy,” and she did. For Kar Yiu’s Final Year Project, she took the plunge with her partner, Sophia Ng Bao Xian, to develop sugar-free ice-cream despite being unfamiliar with the ice-cream making process. Luckily, their task was eased with the knowledge and lab techniques taught in their course and their lecturer’s continuous guidance. 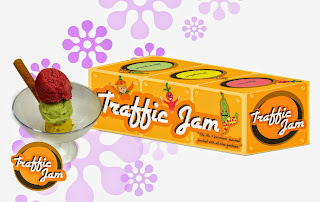 “In order to get the right sweetness, flavour, and fat content, we had 25 trials to develop this sugar-free and low-fat pumpkin ice cream that’s suitable for diabetics and the elderly!” Thus, ‘Traffic Jam’ was created, a three-in-one ice cream made of beetroot, pumpkin and bitter melon, which has the same colours as traffic light. It even received professional recognition by being selected as a finalist in the World Diary Innovation Awards 2014! Kar Yiu’s adventure in innovation doesn’t end here. Wanting to help others enjoy the food that they love, she hopes to land a job related to research and development in the food industry where she can develop different food products that will benefit others; after she graduates from NTU. Be innovative and enterprising, choose your own adventure at NYP Open House from 8 to 10 Jan 2015! Published in the December 2014 Issue of Teenage Magazine. Reproduced with Permission. Talented and driven, this Nanyang Polytechnic (NYP) alumna stepped up during her internship and scored opportunity of a lifetime. How do you make the most of an internship? Ask Shu Xin, who landed a coveted job with Ernst & Young (E&Y), a Big Four audit firm. Step #1: outstanding work performance. Apart from administrative work, she was also given other more challenging duties in various areas that required more thinking and experience. The skills and experience she acquired from the Teaching Enterprise Project at NYP, like accounting management and customer service, sure came in handy. Step #2: take the path less trodden. 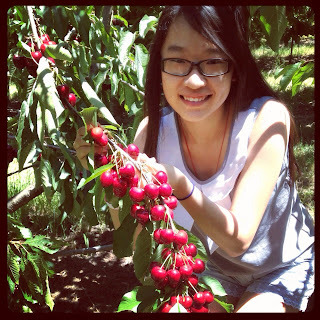 Wanting to focus on gaining experience, Shu Xin decided to enter the working world, despite her good GPA score of 3.78 and being eligible for undergraduate studies. But before making this big decision, she turned to her trusted teachers for guidance. She revealed, “Although it was ultimately my decision, my lecturers shared the pros and cons of each option with me and prepared me for what’s coming ahead.” Her internship manager from E&Y also gave her helpful advice, promising to guide her if she came back to E&Y. It is hard at the moment, isn’t it? Having to deal with all the pressure that you are facing now because of ‘O’ levels, and also having to choose a future path that will be most beneficial for you. Of course I understand, that was what I went through. And, trust me, when I tell you that you will survive through them, just like me. I am still here, writing this letter to you, two years from your future. Even though you will become more confident as time passes, having friends and family by your side and knowing what job you would like to have, you will still be insecure about life after school and what it holds, but I think it will turn out fine. Diyan found her career through her internship adventure; it’s time to carve out your own. Be innovative and enterprising, choose your own adventure at NYP Open House from 8 to 10 Jan 2015! 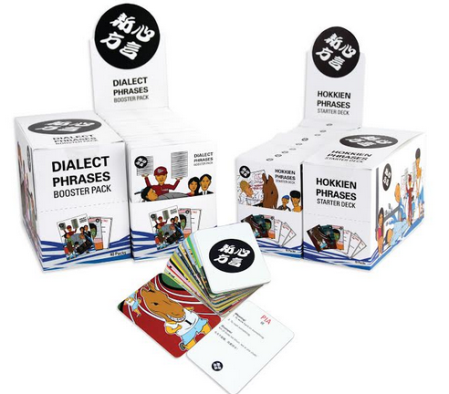 Growing up in a dialect-speaking family, Leonard noticed a language barrier between youths and the dialect-speaking elderly. Hence, he was inspired to revive Chinese dialects in Singapore. However, he knew that traditional methods wouldn’t cut it. “I wanted to create something fun, so I decided to use trading card games, which people are more receptive to playing.” Thus, he invented Xin Xin Dialect, a card game that teaches players Hokkien idioms and phrases, which earned him the 2014 Singapore Good Design Mark (SG Mark). 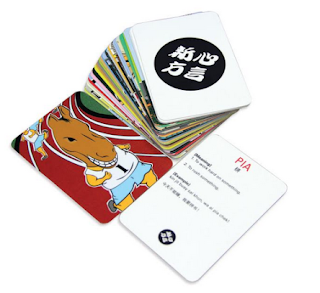 “Thanks to NYP, my project was given a good head start!” Winning The Crowbar Awards 2014, Singapore Design Awards, and the SG Mark competitions, with his entries sponsored by NYP, Leonard now aims to commercialise Xin Xin Dialect by next year. Leonard is one step closer to his inventor dream. You can too! Be innovative and enterprising, choose your own adventure at NYP Open House from 8 to 10 Jan 2015! Judging from his long list of achievements, you wouldn’t have guessed that Dickson is visually-impaired. Making the Director’s List at SBM for four consecutive semesters with a GPA score of 3.92, he has also received the Asia Pacific Breweries (APB) Foundation Scholarship for Persons with Disabilities. Dickson recalled the strong support his lecturers gave him through his challenging academic journey. Because he required a costly computer software called Screen Reader, which reads displayed content, to enable him to study and take exams, NYP installed the software in a computer on campus to facilitate his learning. His lecturers provided electronic copies of everything he needed. They were mindful of his condition and would always make an effort to describe drawings or visual elements on the whiteboard for his understanding. Not just that, they also had the foresight to start Dickson’s internship placement process early, easing his worries about not being able to find an attachment because of his visual impairment. 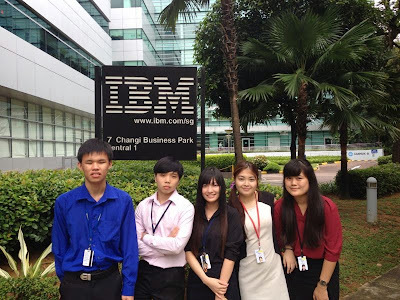 Dickson successfully completed his internship at IBM Singapore. Inspired by Dickson’s adventure in pursuit of further studies? Be innovative and enterprising, choose your own adventure at NYP Open House from 8 to 10 Jan 2015! Like many other school-leavers, Ru Yee and I thought that it would be fun to check out the Open House at all the polytechnics. We were racing against time as we only had a day to view them all. With some quick last-minute planning, we settled on the routes. No doubt we had to move quickly. There were places to go and things to see! On the morning of Monday, 27 October 2014, I attended a dialogue session called ASPIRE (Applied Study in Polytechnics and ITE Review) with special guest, Miss Indranee Rajah, Senior Minister of State for Education and Law. 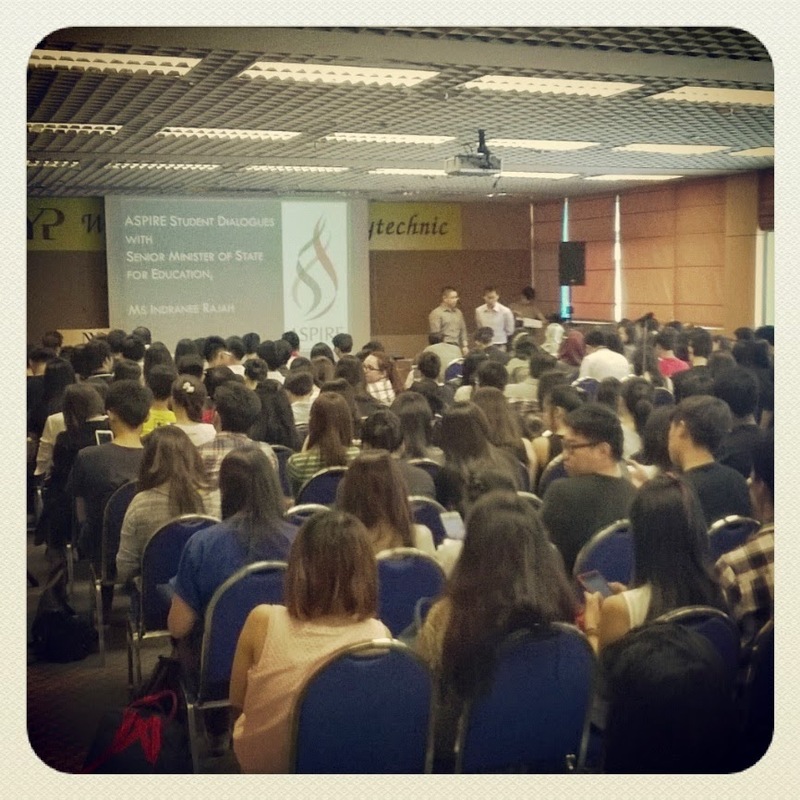 Its main aim was to help us understand what ASPIRE was all about. I now understand that ASPIRE aims to improve polytechnic as well as ITE education to help students studying in these institutions prepare for both the world of work and further education. Here are some highlights of the event and an interview with a student who has a lot of passion for ASPIRE. 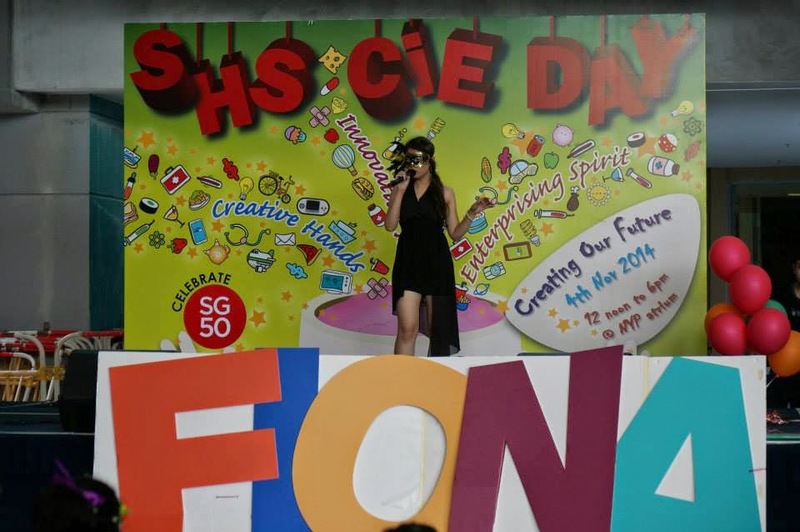 On 4 November 2014, the School of Health Sciences (SHS) celebrated its annual CIE day. In CIE, ‘C’ stands for creative, ‘I’ stands of innovation, and ‘E’ stands for enterprise. On this special day, we celebrate the unique talents of students in SHS. As each of our unique talents may not be recognised due to our school and career commitments, it is great to celebrate CIE day! Students are given an opportunity to showcase their Creativity, Innovativeness and Enterprise through their booths, or performances. The booths were set up at the atrium, and outdoors (around the atrium). All of the booths went through a rigorous selection process before they were selected for display. The items and services sold consisted of rainbow looms, nail polish, flower growing kits, and much more. The performers did not have it easy as well. They had to go through many rehearsals and auditions before finally being selected to perform on stage. Joey with her brand new book! 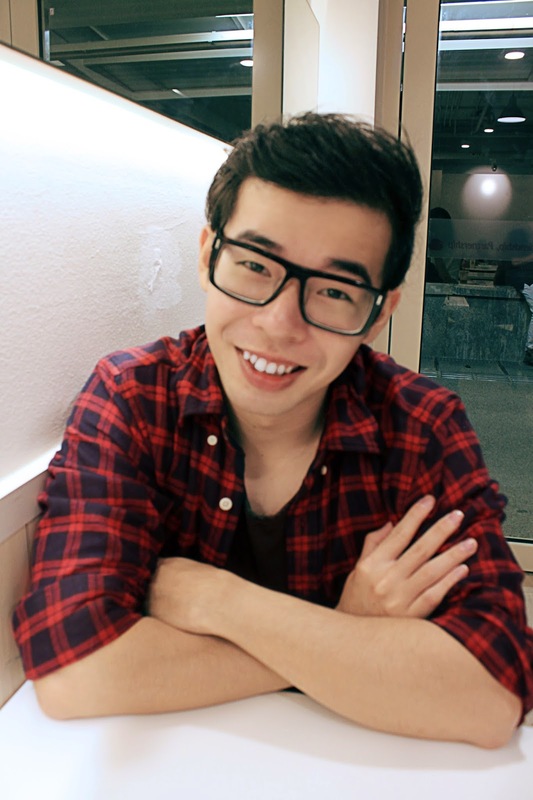 To draw her illustrations about a little Indian boy who fell in love with Chinese opera, NYP graduate Joey Ng Kai Woon spent hours watching videos on Chinese opera. The fruit of her labour -- Joey recently realised her dream of having her illustrations published in a children’s book.